Finally a toilet with overflow protection. Just like sinks and bath tubs have had overflow drains, the Penguin Team has designed a toilet that allows the contents to drain out through a separate line in the event of a clog in the main trap. This secondary drain system adds protection to a toilet against overflow. There is no need to re-pipe or replace the existing plumbing system -- simply remove the old toilet and install the new Penguin toilet. This Penguin Kit includes the Tank, Bowl, Regular Seat, Wax Gasket and Brass Bolts - all delivered directly to your door. The BioBidet Supreme Electric Bidet Seat for elongated Toilets comes with all the luxury features you could want such as the heated seat, heated air dryer, massage and oscillating mode. The 3-in-1 nozzle system delivers a signature oscillating vortex water stream, excellent posterior wash, and softer feminine wash with bubble infusion technology. Settings are customized with the included wireless remote, and the unit is both self-diagnosing and self-cleaning. It attaches to your round toilet without plumbing alterations and is made from germ-resistant plastic. A built-in water filter blocks microbes. Energy is managed by power-saving functionality. 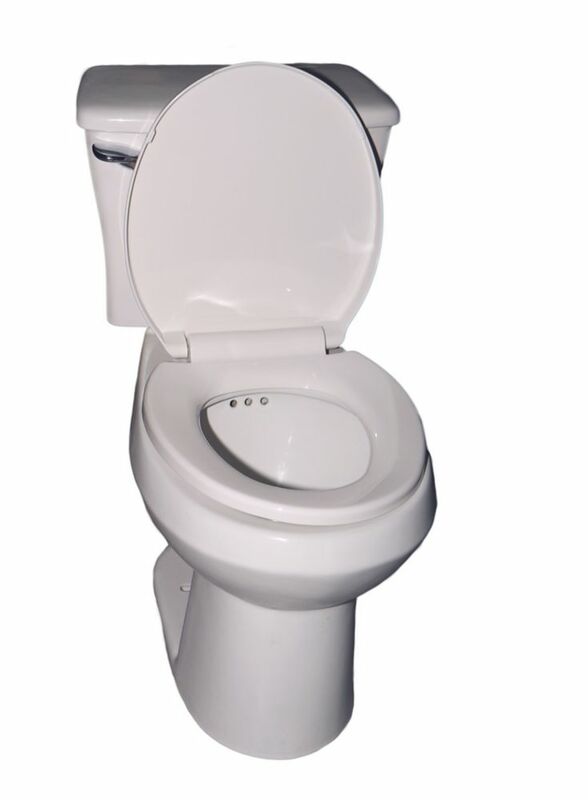 Glacier Bay 4.1/ 6.0 LPF 1 piece Dual Flush Elongated High Efficiency All-In-One Toilet. Liquids flush at 4.1 LPF, solids flush at 6.0 LPF. Chrome plated top mounted flush button. EPA WaterSense Certified. Meets HET rebate standards - high rebate $$$. Chair height elongated bowl meets ADA standards. Large footprint - excellent for retrofitting. Everything you need in one box - tank, bowl, wax ring, floor bolts w/caps and toilet seat. The Penguin Toilet with Overflow Protection - Single Flush Round 2 Piece Toilet Finally a toilet with overflow protection. Just like sinks and bath tubs have had overflow drains, the Penguin Team has designed a toilet that allows the contents to drain out through a separate line in the event of a clog in the main trap. This secondary drain system adds protection to a toilet against overflow. There is no need to re-pipe or replace the existing plumbing system -- simply remove the old toilet and install the new Penguin toilet. The Penguin Toilet with Overflow Protection - Single Flush Round 2 Piece Toilet is rated 5.0 out of 5 by 1. Rated 5 out of 5 by Monie from Penguin Toilets with over floow We purchased 13 toilets and plan on purchases yearly a large sum of toilets for our retirement residence. It gives us peace of mind that the dementia resident can not over flow their toilet. It has saved us alot of money in the long run. What is the depth of this toilet from the front of the bowl to the back of the tank? I don't think that it can be 16&quot; as listed in your specs. Also, what is the rough in dimension? 10, 12 or 14&quot;?